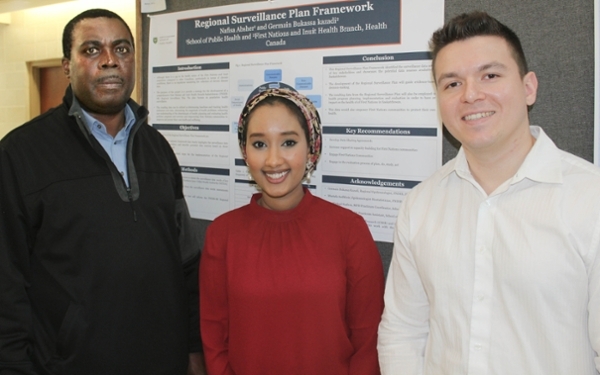 Master of Public Health (MPH) student and Dr. James Rossiter MPH Practicum Award recipient Nafisa Absher shares the story of her inspirational practicum placement. As a refugee, I have always had an inclination to address the range of social and political issues that contribute to health and health inequities in both rural and urban settings. Therefore, my passion to improve the health of marginalized populations with an integrative approach led me to pursue the Master of Public Health (MPH) program at the University of Saskatchewan. As part of the MPH program, I completed a 12-week summer practicum placement with the Health Surveillance and Assessment (HSA) unit of Health Canada’s First Nations and Inuit Health Branch Saskatchewan (FNIHB-SK) in Regina, Sask. I specifically chose this placement to explore the role of population health surveillance in addressing health disparities among the Indigenous and Inuit populations in Saskatchewan. During my practicum, I conducted a surveillance data needs assessment through qualitative key informant interviews that guided the development of an indicator framework. The purpose of the framework was to provide a strategy for the development of a comprehensive FNIHB-SK Regional Surveillance Plan, which will serve as the blueprint for the ongoing and systematic processes of collection, analysis, interpretation and dissemination of data for both communicable and chronic diseases. The resulting data can be used to establish baselines and track health indicators over time, determine the magnitude of health problems, enhance the understanding of the determinants of health, plan and evaluate health policies, programs and services, and empower Indigenous communities to improve and protect their own health and wellbeing. I greatly benefitted from this practicum placement, as it provided me with a well-rounded experience. By developing an indicator framework, I gained a deeper understanding of the public health surveillance processes for Indigenous communities in Saskatchewan, and the importance of evidence-based decision-making in public health to improve the health status of Indigenous and Inuit populations. I also produced an ad-hoc epidemiology report, visited Indigenous communities in Saskatchewan and engaged with health directors, and attended a number of meetings within FNIHB-SK. This experience has affirmed my passion for health equity and working with marginalized communities to improve the health and wellbeing of their people. I was able to network and collaborate with interdisciplinary professionals to advocate for the need of a Regional Surveillance Plan to reduce inequities in the health status of Indigenous people. Visiting communities and speaking with health directors opened my eyes to how the determinants of health influence the health and wellbeing of Indigenous people. These lessons will stay with me throughout my career as a public health professional and ensure that I play an active role in improving the health and wellbeing of vulnerable and underserviced populations. I am grateful to the Canadian Institute of Health Research (CIHR) for funding this work through the Dr. James Rossiter MPH Practicum Award. Through this award, I was able to focus my time and efforts into my practicum experience. It allowed me to pursue a placement that spoke to my passions and delve deeper into the area of health inequities and explore the opportunities present in the field. I would also like to express my sincere gratitude to the staff of FNIHB-SK including my field supervisor Germain Bukassa Kazadi, regional epidemiologist, Mustafa Andkhoie, epidemiologist-biostatistician, and the HSA unit for guiding and supporting me throughout this practicum project. By Nafisa Absher, MPH candidate.